Trader’s Way was established by a group of financial market professionals dedicated to spreading the values of free, limitless trading globally. Trader’s Way provide our clients with the widest opportunities available on financial markets. Trader’s Way collected the best products, technologies and services, so that the needs of every trader are fully satisfied. You can choose any financial market or all from the wide range we offer access to. You can trade currencies and stocks, energies, metals or commodities using the most famous and user-friendly MetaTrader 4 trading platform. Moreover, if you travel widely or prefer other than MS Windows operating systems, there’s no need to set limits to your moves, software and computer choice. Our unique trading platform – Trader’s Way Web Trader (available only on cTrader platform) will let you stay connected to your trading account any time, any place, from any computer, with any system. Mobile Trader (available for all trading platforms) also allows to work without location and time limits, on the go, providing access to trading accounts from mobile devices. 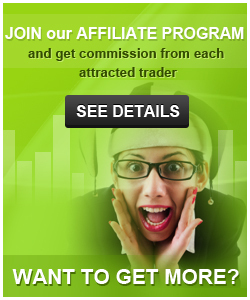 Trader's Way widens your trading opportunities providing you with a 100% bonus on your deposit. You only need to make a deposit, send us an email and the bonus will be credited to your trading account. The bonus is cashed to your account on a daily trading volume basis. Trading with Trader’s Way you can be sure of the widest range of trading opportunities. All financial markets, different types of accounts for any taste and the most advanced technologies are at your services. Enjoy the freedom of trading and live the life of maximum opportunities! 2. Contact TradersWay to have the funds transferred from your old account to the new one.